At the center of your tool wheel is a circle representing the current color and opacity of your current tool. Tap the circle to bring up the COPIC color wheel. 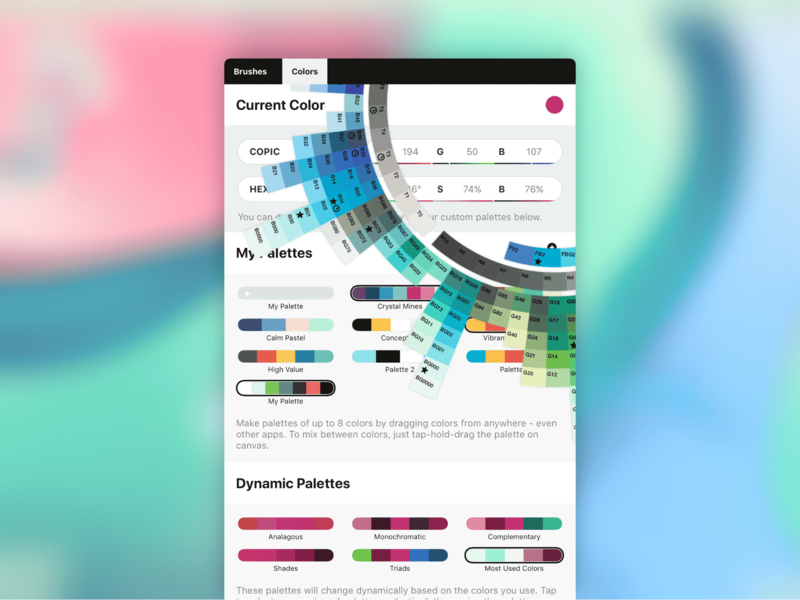 This wheel is a spectrum of colors hand-picked by Too Corporation to help artists and designers add consistency and beauty to their work while simplifying the matching process. These colors are mathematically sorted by pigment and saturation, and are represented on the wheel by a letter+number code. Visit here to learn more about Copic color theory. The values in Concepts are as similar as they can get to their real-life marker complements. The color wheel is spinnable. Drag your finger up or down to turn the wheel. 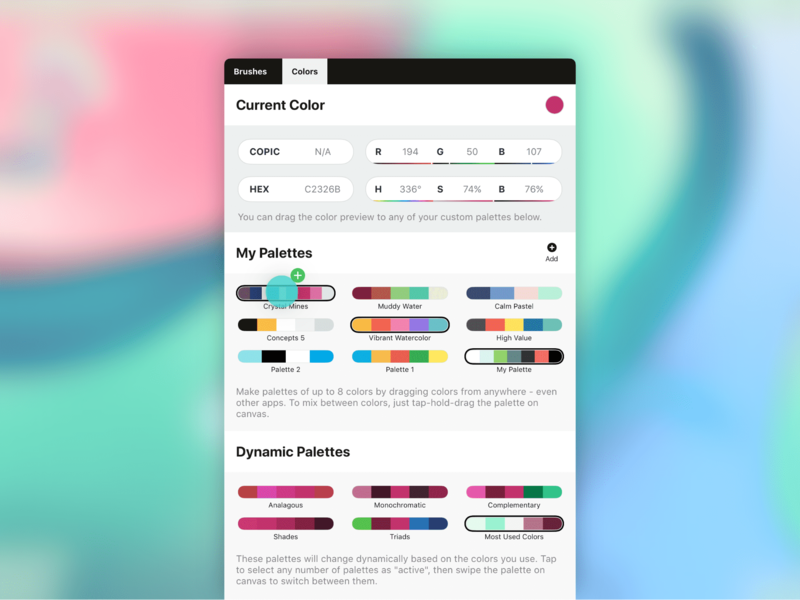 At the center (beyond the tool wheel), you’ll find a star denoting your favorite colors, which will bring you to the Colors menu and color palettes, and an eyedropper activating the Color Picker. Next you’ll see a tonal value spectrum, true black and white, and when a color is available to your clipboard, another block containing that special color. Next is a ring of your cool, warm, neutral and tonal grays. Then the colors in their particular blending gradients, in all their glory. The occasional clock tells you it was one of your latest used colors. The star denotes your favorites, which are remembered on the Colors menu for easy reference and dragging into new color palettes. Tap on a color to set it to your active brush. Tap+hold a color to drag & drop it into another supported app. Tap+hold the color circle at the center of the wheel to bring up your Colors menu. 1. Your current color is shown in the circle to the upper right. Tap+hold+drag the circle to pull the color into any of the color palettes lower down on the menu. 2. Tap the current color circle to bring up the COPIC color wheel inside the menu. 3. 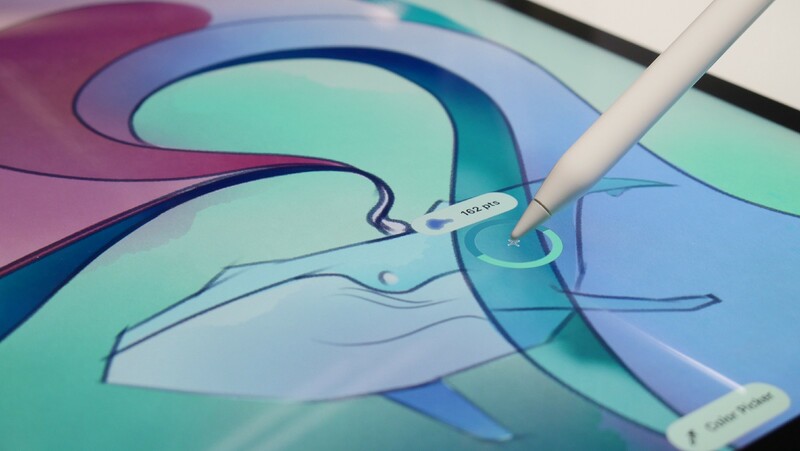 In the next section, you can manually type color values into the COPIC, RGB, HEX and HSB fields to find custom colors, or drag the tip of your finger / stylus along their spectrums beneath. The color will appear in the color circle up top. 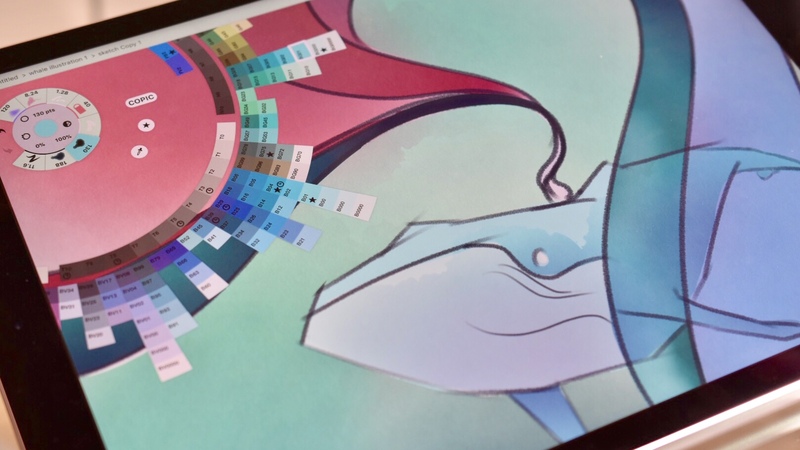 You can hang onto that custom color by dragging it into a color palette below. 4. In My Palettes are your custom palettes. 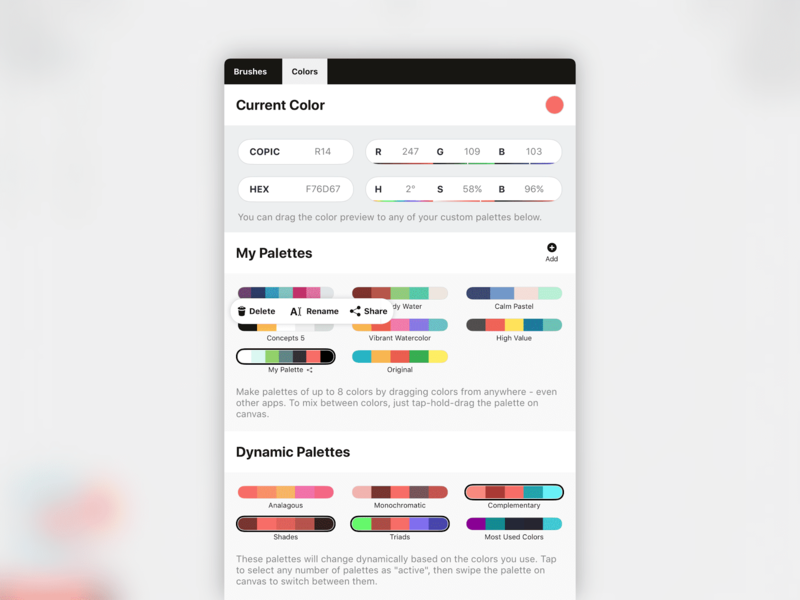 Tap a palette to activate it and access it from the main canvas via the scrollable color mixer. They will appear in the color mixer in the order you tapped them in. 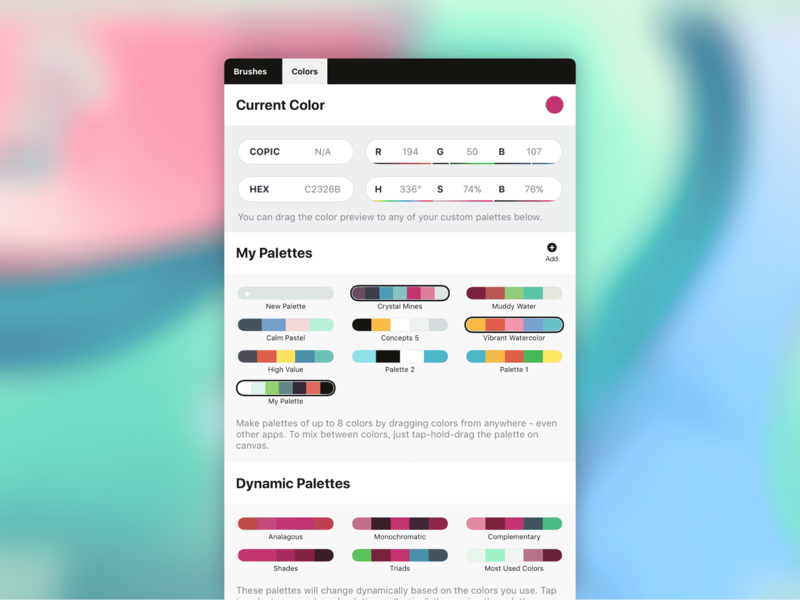 Tap the + button to create a new palette. You can have an infinite number of palettes, and each palette can have up to 8 colors inside it. To add a color to a palette, tap+hold+drag any color on screen (or from Drag & Drop supported apps) and pull it into the palette. The animation will guide you. 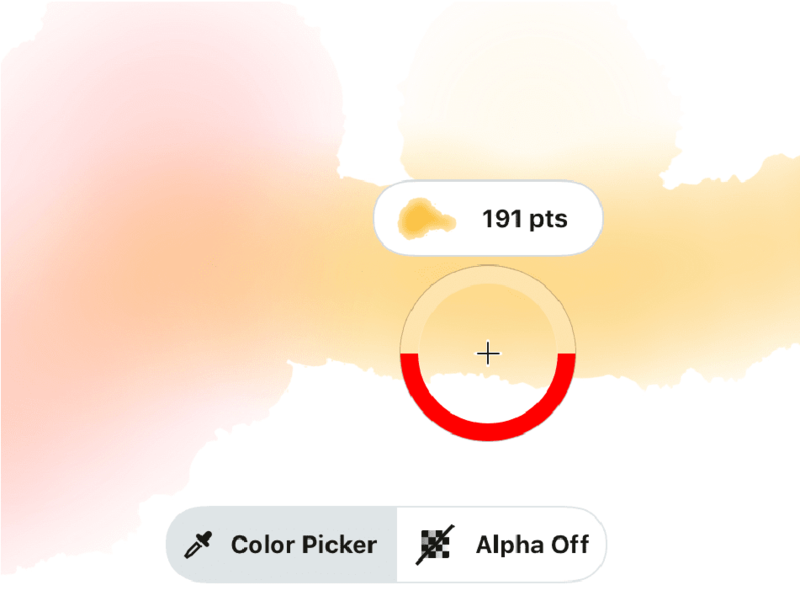 You can drag from the current color circle, from the COPIC color wheel (tap the circle to bring it up), or from any other palette in the menu, including the dynamic ones below. To re-order colors in a palette, tap+hold+drag the color, and move it to its new spot. To remove a color from a palette, tap+hold+drag the fated color away from the palette and release it. 5. At the bottom are your Dynamic Palettes. Helpful for choosing shades based on color math and recently used colors, you can always rely on them to give you a good match. When you subscribe to Concepts’ team-sharing capabilities, you can share your color palettes with your team members, colleagues, or anyone who has a Concepts account. Helpful for keeping projects synced and to standard, it’s also super simple. 1. Tap+hold your palette to bring up its popup menu. We highly recommend naming your palette before sharing it. Since it’s read-only to everyone but you, this helps your colleagues to remember what your special palette was for, exactly. Sharing is public, but is only discoverable by people who have the link. Your palette is read-only to everyone except you. You are the only one who can add or remove items, or rename the palette. Any changes you make will instantly appear on anyone’s device that has subscribed, with whom you’ve shared your link. Any palette that you have created, you can share. Content shared is subject to our Terms of Services. Anyone can unsubscribe from your share at any time. 3. A menu will appear with your palette preview and its own Direct Link. Tap+hold the link to copy it to your device’s clipboard, or just tap Share in the upper right corner to show your device’s sharing locations. 4. 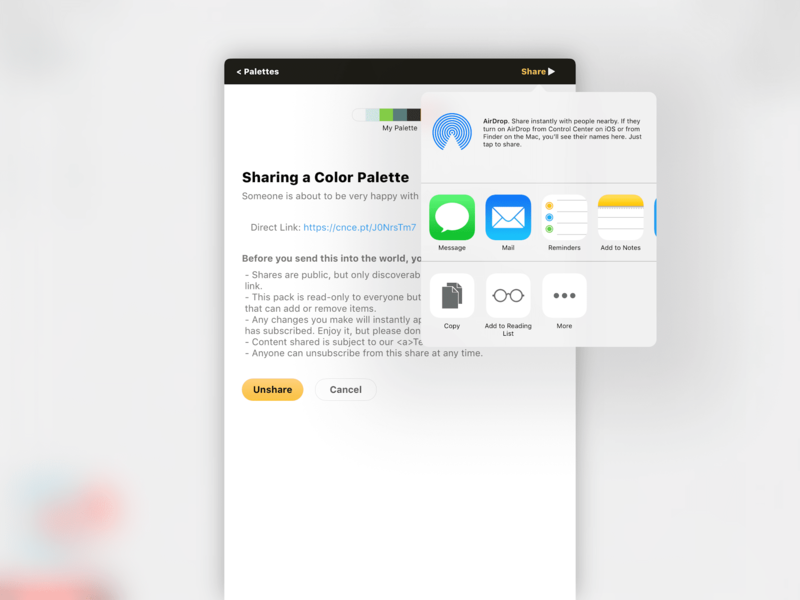 Paste your link into a message, email or other application, or touch the location on the sharing popup to share your color palette. 5. Anyone with the link can load your palette to their device for use in their own projects. Any time you update your palette, their palette will update, too. The Concepts color picker is certainly a traditional color-picking tool, but it also has some neat properties as part of a vector-based application. Tap the color circle in the center of the tool wheel to bring up the COPIC color wheel and find the eyedropper. Tap+hold anywhere on the canvas to bring up the Selection menu. With another finger, you can tap the left button to toggle from Item Picker to Lasso to Color Picker. This is a great shortcut for selecting colors and brush properties without having to break your drawing flow. 1. Its shape. The circle acts as your target zone, with the crosshairs at the center giving you the exact point of choice. 2. The solid color on the bottom half of the rim is your currently selected color for your brush. It won’t change until you tell it to. 3. The changeable color along the top half of the rim is the color your crosshairs are currently touching. This is the color your brush will take on if you let go of the color picker. Notice that in the bottom of your screen is a popup where you can toggle between ‘Alpha On’ and ‘Alpha Off’. With alpha on, the color picker will ignore the background and also detect the opacity of the color. With alpha off, you will always get a color with 100% opacity that includes the background color in the mix (like traditional pixel apps). 4. While the ring analyzes the color and opacity of the stroke, the tag floating above the circle shows the vector details — its brush type and size etc. These are the characteristics of the brush you used when initially drawing the stroke. If you tap the tag instead of letting go of the ring, it will assign the exact brush you used to your tool slot.